According to Murphy’s Law of Toilets, any time a toilet can clog, it will clog. Usually, when a toilet clogs you’ll just grab the nearest flange plunger and get to work. But what happens when you can’t do that? Maybe you just moved into a new place. Maybe you’re at your plunger-less friend’s house. Or, who knows, maybe your dog just ate your old plunger! …or something. First, grab a big bucket of hot water. Important note: you want hot, but NOT boiling water. Boiling water could crack the porcelain of the toilet bowl. Instead, just fill a bucket with the hottest water your tap can provide. Pour that water into the toilet bowl until it’s nearly full and let it sit. The heat should help break down any solid waste enough for the toilet to flush it down. If this doesn’t work, don’t panic–just move on to the next methods. The “hot water trick” is just the place to start. Squeeze a bunch of dish soap into the toilet bowl. Let it sit for about fifteen minutes. The soap will help break down any solids. It’ll also lubricate the bowl and pipes themselves, making it easier for the clog to slide into the drain. After you use the dish soap, try the “hot water trick” again. Pour a pot of hot (not boiling!) water into the bowl. Let it sit again, this time for around thirty minutes. After you give the water and soap time to unclog, try flushing again. If that still hasn’t solved the problem, try repeating this process again. You could also try letting the dish soap sitting longer–even all night! If you happen to have Epsom salt lying around, you’re in luck. Pouring Epsom salt into water triggers a chemical reaction that makes the water start to fizz and bubble. All that fizzing and bubbling can seriously help dissolve clogs. Pour a hefty amount of Epsom salt into the toilet bowl. Let it sit for fifteen minutes, then attempt to flush. You should see positive results after the first flush. You could also combine this technique with the dish soap and “hot water trick” for good measure. This is the most direct way to clear a clog. If you’ve tried heat and chemical reactions without success, it’s time to reach right in. Unfold a wire hanger, stick it into the toilet bowl, and wiggle it around in the opening. This might be kind of gross depending on what the clog involves, so we recommend wearing gloves. Be careful not to accidentally damage the toilet bowl while you’re working. Wire hangers can easily scratch up porcelain if you’re too rough or non-discriminate. 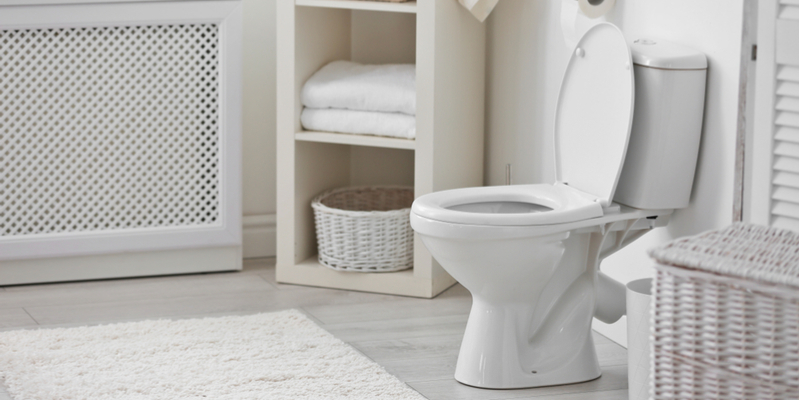 After you’ve unclogged your toilet successfully, there are a couple of things you should do. First: go out and buy a flange plunger. These plungerless techniques will do in a pinch, but they’re no substitute for the genuine article. Next, figure out why your toilet clogged in the first place. Does this happen a lot? If it does, it may be because there’s a more significant problem with your home plumbing. If that’s the case, you should get in touch with the pros at Mike Diamond. We’ll take a look at your home’s plumbing and figure out why you’re dealing with these clogs. We’ll be able to help make sure you don’t need that new plunger for a while.